This is one of my favorite moments from Vanuatu and it doesn't even need much of a writeup. All you have to do is look at the expression on Sarge's face. 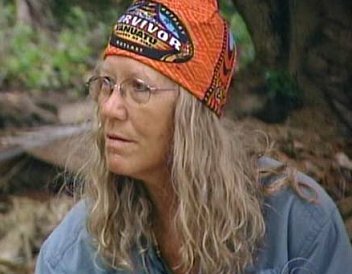 At the end of the eighth episode, Julie and Twila blindsided the men of Lopevi when they teamed with the women and voted Rory Freeman out of the game. The men, of course, hadn't seen it coming for a second. They had put all their trust in Julie and Twila. And... understandably... the men were now a bit upset. And nobody was more upset than Lopevi's leader, Lea Masters. The guy they called Sarge. So Sarge is sitting there the next morning, and you can tell he's ready to throttle Julie and Twila by their little necks. He's just sitting there, staring at the fire, and drinking his coffee. 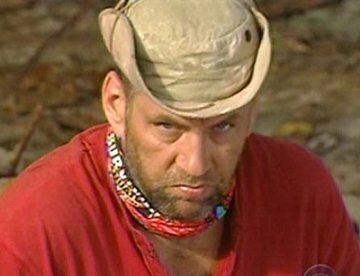 And he's got one of the angriest looks on his face I have ever seen in my life. The cameraman lingers on Sarge's face for a while, and this is amusing enough, but then we kick into high comedy when Scout comes over, she sits down next to him, and she starts singing a happy little melody under her breath. Hmmm hmmmm... what a beautiful day... la la la... the sun is up... it's shiny and new... la la la. The look on Sarge's face when Scout starts singing is priceless. He is about one second away from ramming his coffee mug into her skull, yet she's either too clueless to notice this... or she's deliberately egging him on just because she knows she can. My money is actually on the latter option (deliberate taunting) because Scout seems to love to needle people like that. In fact she does the same sort of thing to Eliza pretty much all game. You see, Scout has always had a passive-aggressive malicious streak in her, and this is one of my favorite examples of it. She's just sitting there, singing happily and trying to get some sort of a reaction out of Sarge. 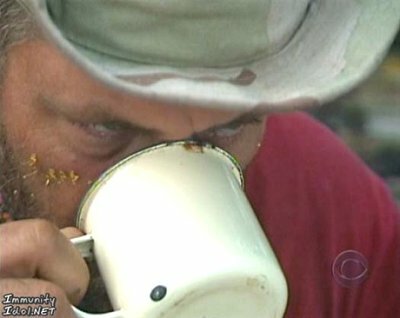 In any case this is one of the funnier moments of Survivor: Vanuatu. It's just a short, quiet little scene at the very start of the episode... but nearly everybody seems to remember it. Scout's just singing and humming away and it's taking all of Sarge's effort not to give her the reaction that's she's trying to get out of him. 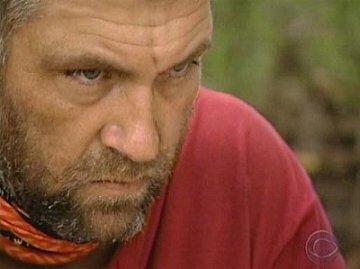 I truly believe this is the closest anybody ever came to being killed during an episode of Survivor. P.S. Luckily... I get to see this game ("Let's needle somebody into a reaction!") played out ten times a day in my living room at home. The only difference is that my participants are my kids and they seven and four years old. So it's refreshing to see grown adults acting like preschoolers for a change. Two thumbs up to Sarge and Scout for that one.